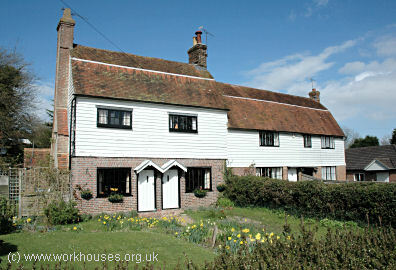 A workhouse operated at Cranbrook from around 1723, and at Goudhurst from 1725 (Hitchcock, 1985). 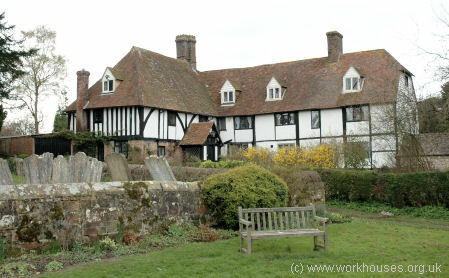 From the 1760s, Cranbrook's workhouse occupied Sissinghurst Castle. A parliamentary report of 1777 recorded parish workhouses in operation at: Benenden (for up to 40 inmates), Cranbrook (100), Frittenden (40), Goudhurst (55), and Hawkhurst (100). 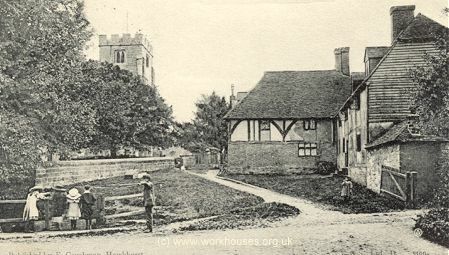 Hawkhurst's parish workhouse was located on The Moor at the south of the village. 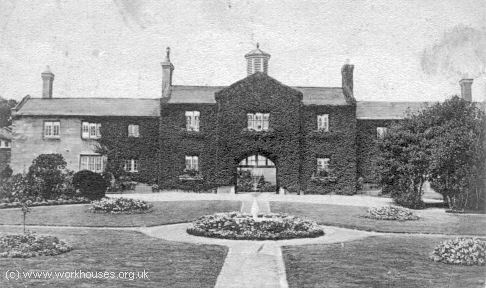 Hawkhurst former parish workhouse, c.1908. Hawkhurst former parish workhouse, 2005. 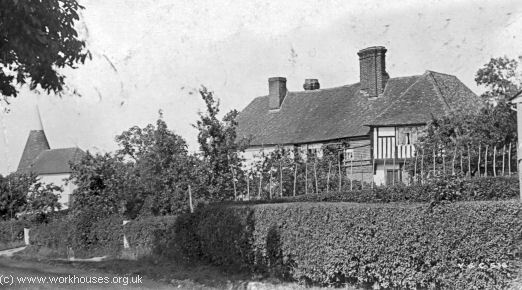 Sandhurst had a parish workhouse on Back Road, now known as Fairview Cottages. 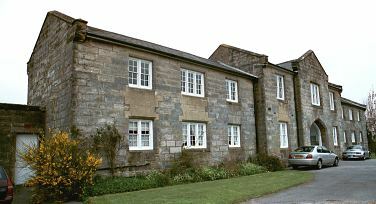 Sandhurst former parish workhouse, 2005. 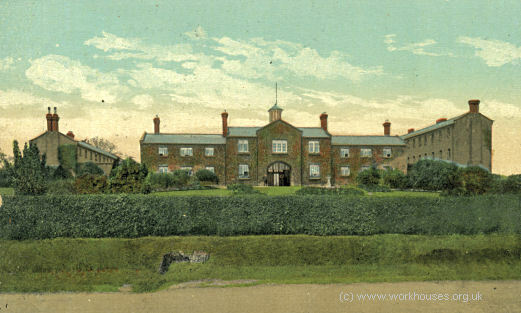 Frittenden former parish workhouse, c.1910. Kent: Benenden, Cranbrook, Frittenden, Goudhurst, Hawkhurst, Sandhurst. The population falling within the Union at the 1831 census had been 12,816 — ranging from Frittenden (population 816) to Cranbrook itself (3,844). The average annual poor-rate expenditure for the period 1833-35 had been £11,881 or £18s.6d. per head. The new Cranbrook Board of Guardians held their inaugural meeting on 4th November. At their meeting on the 17th of November, a workhouse committee was formed to form plans for the building of a new Union workhouse. This was eventually constructed in 1838 at Hartley. The architect was John Whichcord, who was also responsible for the workhouses at Dartford, Malling and Tonbridge. He also adapted Sir Francis Head's model courtyard plan for use at East Ashford and Maidstone. The workhouse location and layout can be seen on the 1897 map below. Cranbrook entrance block from the south-east, c.1908. The building had a two storey entrance block at the east which featured a central entrance archway. Cranbrook entrance block from the south, 2001. Cranbrook from the south-east, c.1912. Cranbrook from the south-east, 1920s. There were further blocks at each side and a central T-shaped block to the rear. Cranbrook southern accommodation block from the south, 2001. The surviving buildings have been converted to residential use. Kent History and Library Centre, James Whatman Way, Maidstone, Kent ME14 1LQ Holdings include: Guardians' minutes (1835-1930); Admissions and discharges (1913-30); Births (1836-70); Deaths (1836-70); Creed registers (1894-1932); Lunatics' discharges/deaths (1916-30); Register of mechanical restraint (1891-1935); etc.